The crime scene. Photo by KMV. A man was stabbed at Brighton Avenue and Linden Street around 1:40 a.m., State Police report. KMV reports the injuries were not considered life threatening. 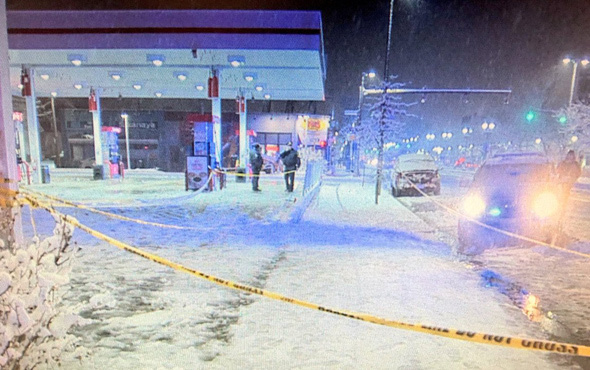 The three men stopped fighting, and it was discovered that a 25-year-old man had been assaulted and stabbed by one of the men, later identified as Ruoding Zhang, 39, of Brookline. Zhang was placed under arrest by Trooper [Brendan] Donovan. Boston Police officers arrived on scene, as well as their detectives and crime scene services. Boston EMS transported the victim to Beth Israel Deaconess Medical Center for treatment. While assisting Boston Police with a search of the area, Trooper Donovan located a knife that is believed to be the weapon that was used in the altercation. Zhang was charged with assault and battery with a dangerous weapon, State Police say.